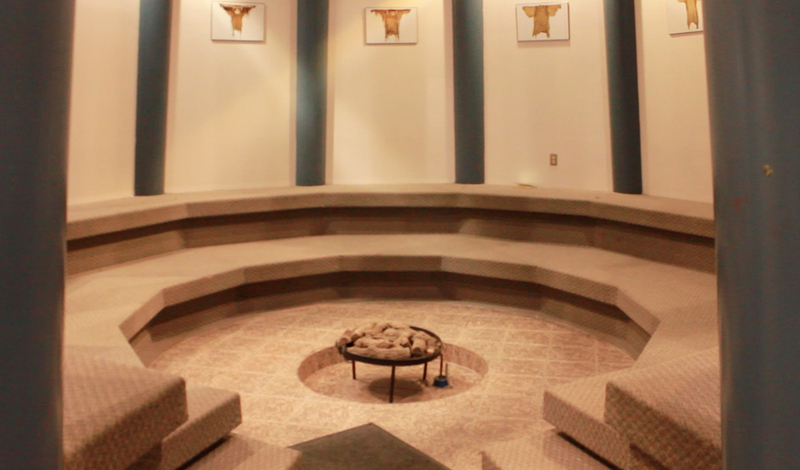 Although our main focus during our journey is to higher education initiatives emerging from indigenous scholars, community activists and artists, throughout our time in Canada, Mexico and Peru we also encountered and learned from teachers, students, community activists and organisations working to promote these indigenous ways of knowing, being and doing in primary, middle and secondary schools. Our first experience visiting in/with primary, middle and secondary schools was in the Blackfoot Kainai (Blood Band) Reserve in Alberta. It unexpectedly came through the form of running – across open prairie. A couple of days before the race, we met Narcisse Blood and his wife Alvine Mountain Horse for dinner in Fort MacLeod. Alvine, a middle school teacher at the Kainai Middle School on the reserve, and PhD student at the University of Calgary, is a mother of four, grandmother of many. She is also a long distance runner and has been since she was a girl. Alvine seemed tired during our dinner, unsurprisingly, as she is busy doing so many things. However, after I mentioned something about my decision to attend university on the east coast of the US because of being recruited at that time for running (and high jumping), her energy returned and we were suddenly very engaged in an animated conversation – stories about running, about racing, about coaching. Alvine told us of her most recent 10km race (just three days before) where she had fallen badly, injuring her knee and her face. She was concerned about her ability to do well at the upcoming annual race celebrating the signing of the Treaty – two days later. Her knee was still swollen and there was still bruising on her face. Yet, I could very clearly see the fire in her to run, to compete, to participate. I think once someone becomes a runner, develops a love for running, it is somehow always there, seeping into the core of your being. So far on this journey, I have done far less running than I would have liked, I not only miss it, often I long for it. I see someone running on the edges of a park, or alongside the sea, and I wish I was there, feeling the air on my skin, seeing the ground blur beneath my feet, wanting to experience the tiredness and the simultaneous satisfaction that comes with running. This passion for running is not universally shared, but between those that do share it, there is an immediate connection. I found this connection with Alvine. At the end of our lovely meal together, I also found myself signing up for the annual cross-country race taking place in two days. The 3-mile or 5-mile race (we could choose) was to be across prairie, finishing on the grounds of the Kainai primary, middle and secondary schools on the Blood Reserve. 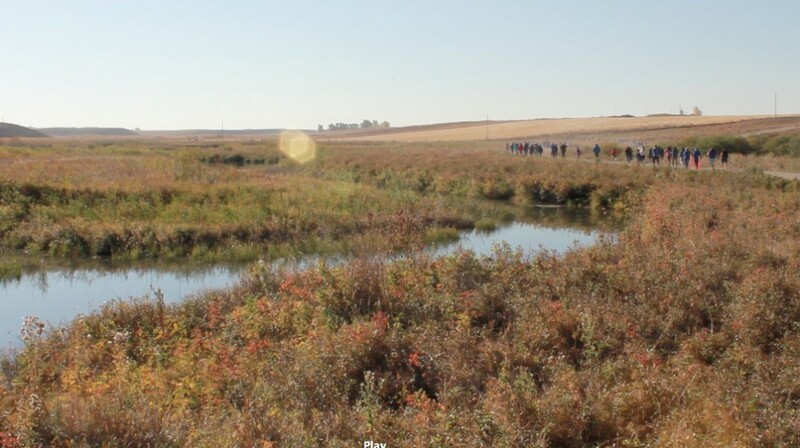 This particular day of the annual run was to be held on the 125th anniversary of Treaty Seven which signed the reservation territory, amongst other laws and regulations, to the Blackfoot. I was really nervous arriving to the Kainai Middle School that Friday morning and timidly asked for directions to find Alvine. There was chaotic and nervous energy that always comes with organizing so many children and teenagers. 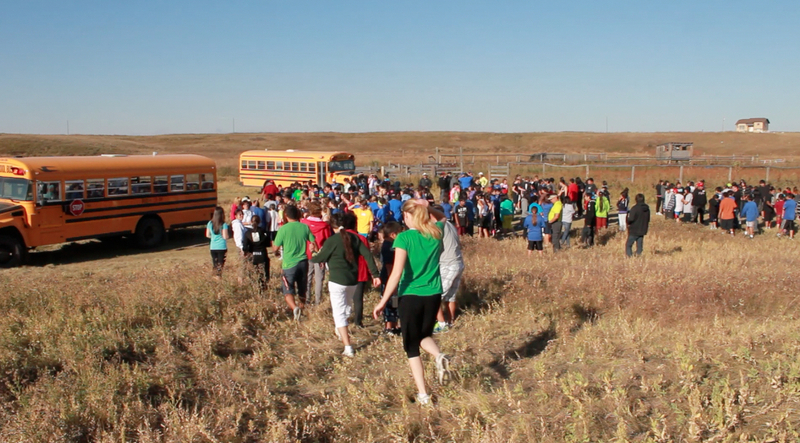 At least 10 buses were parked outside from different schools in the area – members of other Blackfoot bands and non-Blackfoot schools as well. Teachers were trying to organize the hundreds of school-aged children and young people who were excitedly putting on their running shoes, trying to find out where to pin on their numbers. 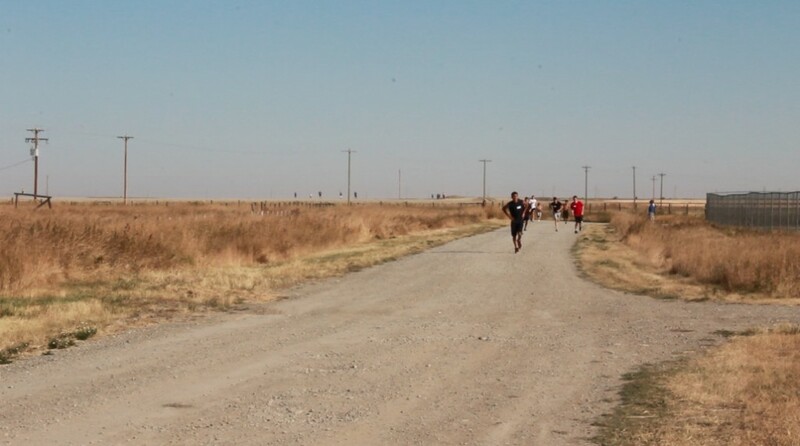 The dry, open sky and vast horizon of southern Alberta reminded me very much of Klamath Falls, Oregon where I grew up, and I was suddenly feeling the nervousness I would have felt over 20 years ago, competing as I once did in high school, for the cross-country running team. Only now, I was not very fit – an obvious outsider – joining hundreds of children, young people and adults from the area who participate in this annual event. Udi was taking it all in as someone who has not only ever run a cross-country race, but has also never witnessed such an event. After asking several teachers, I eventually found Alvine in her classroom. She was hurriedly trying to gather her own belongings for the race – numbers to pin on our tops, lists of student names, her tee-shirt. I noticed many different Blackfoot words written neatly on the blackboard. She walked with me out of the school and the three of us climbed into our car. She directed us for a few miles, from paved to unpaved road and finally to a field where there was no road at all. I looked around to see hundreds of school-aged children, from what I guessed were 6 years old, through the end of secondary school (18 years old) and many adults (teachers). It was the first time in my life I had ever run with such a diverse and disparate group, all associated with schools in the area. Any school-related running race in my time was always separated quite rigidly into different age groups. I do not remember ever running alongside any of my teachers. We all gathered together, finding a place to stand where we could. One of the teachers from the high school gave us all directions, to run alongside the flags he had just stuck into the ground early that morning. He told us to be careful of the uneven surface. Alvine looked at me and said not to wait for her, that I should try to win, that she was still injured and not sure how fast she would run. I told her I was completely out of shape anyway and happy to run with her. The gun went off, many children took off fast, excited about what it was that we were doing. I noticed that many of them looked completely unprepared to run – some in jeans, shoes that we clearly not made for running. Yet they all seemed very happy about running several miles in the hot sun on unknown terrain. There was no one whining, which I would have expected from some of the children and teenagers. I ran alongside Alvine for about a half mile or so and noticed I was still feeling surprising fine. I also noticed that I wanted to run ahead and try and catch a couple of the female adults who were not so far ahead. The competitive streak in me came right back and was strongly encouraged by Alvine. She kept whispering between laboured breaths – “go ahead, try to catch them, try to win”. I laughed with her encouragement and decided to, although I also felt a pull to stay with her and run alongside for the duration. I ran ahead at the top of a small hill coming out of the coulee. I noticed two women in front of me and set out to catch them. One of my favourite training activities during my cross-country high school days was when my coach would start us all separately – one minute or so apart. The goal was to try and catch as many people as you could over a 3 mile course. It was the same here, only 20 years later. I picked up speed for the rest of the race. I chatted to many children and teenagers along the way. Many of them would walk and then sprint, rather than running continuously. 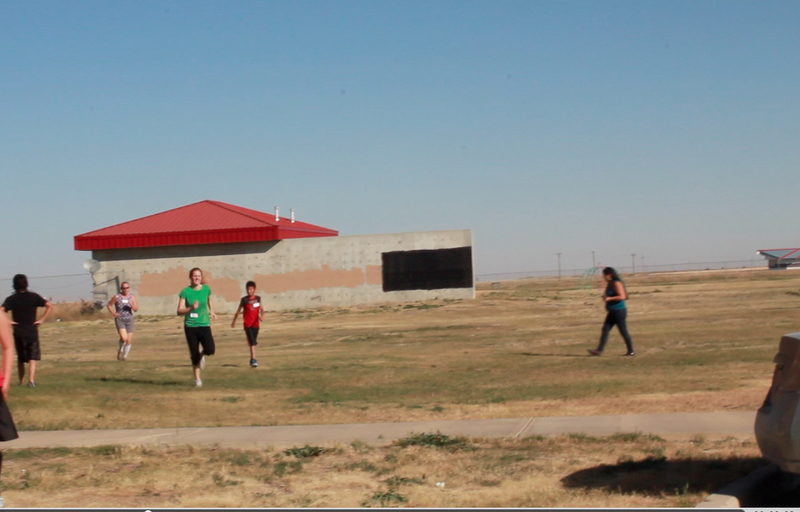 I encouraged them to run slowly – to run with me, and a couple girls (I guessed were about 13) did. We made light conversation that got increasingly more difficult as we all approached the school. I noticed another adult female runner in front of me, nearing the school and I decided to catch up with her before the finish line, which I did (just barely). Udi was at the finish line, clapping, yelling and filming. I was exhausted – but felt exhilarated as I often do after a challenging run. I ran back to find Alvine, to encourage her and run with her the rest of the way. She was happy that she finished, her knee really hurting her. After the race we walked around the school buildings, chatting with Alvine and some of the other teachers – Alvine was proudly introducing us to people, saying that the race had become ‘international’ with us being there. A warmth and joy pervaded the environment through vocal encouragement and generosity of food and care. It was important to all the teachers there that everyone who participated in and witnessed the race be provided a full meal. Everything was free. Several of the students came to speak with Alvine. It was clear how very loved and admired she is by students of all ages and teachers. The entire event contrasted strongly with running events (races) that I participated in – in the past. The diversity of ages running alongside one another was very powerful, particularly as there was so much encouragement – from young to old and old to young. Although there was a competitive air, it was friendly. 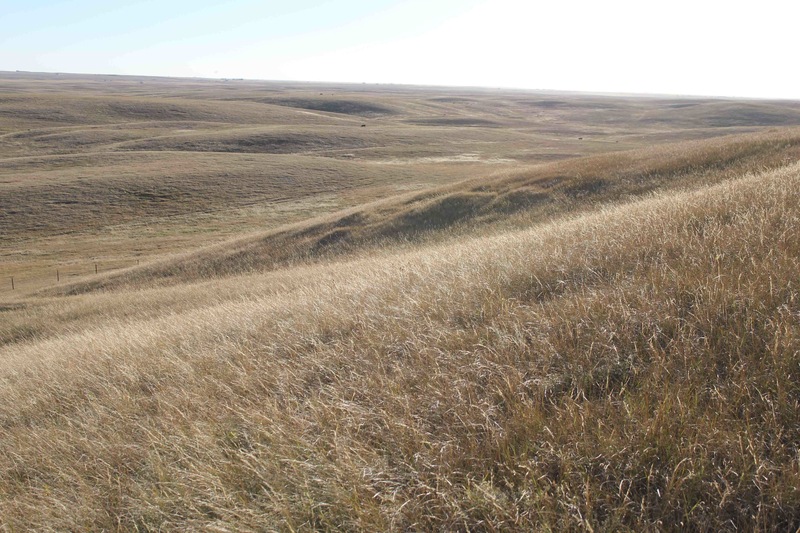 I wondered how much of this conviviality had to do with the very reason we were all there running and connecting with the ground beneath our feet –– in celebration of the sovereignty that exists on this part of the land, the Blackfoot territory. 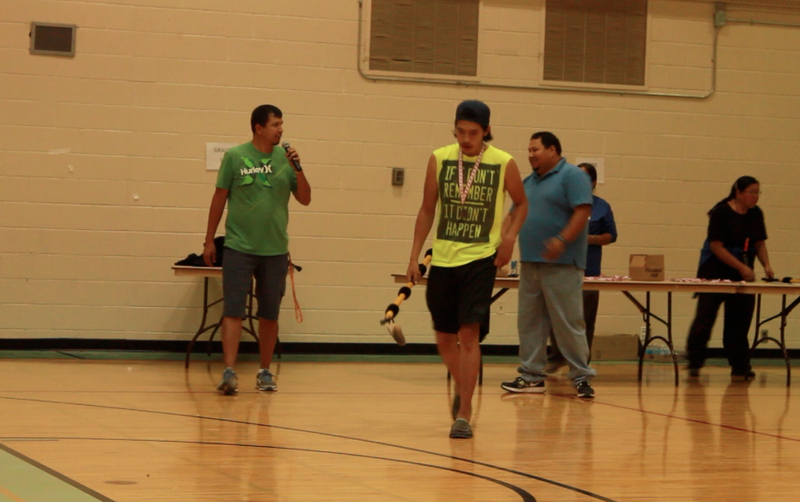 An awards ceremony began soon after in the high school gym with a Blackfoot prayer being spoken by one of the Blackfoot Elders in the community. Udi and I were both inspired to see the hand-made spears (rather than trophies) that were given to the top male and female (of all ages) finishers of the 3-mile and 5-mile races. The spears were about 2 meters long, hand-carved, with leather straps and fathers wrapped around them at three different sections. The end of the spear looked as if it had been carved from obsidian. I received a medal for being a top-3 female finisher in the over-29 age group, which I was rather pleased about (perfect souvenir!). After the race, Udi and I explored the schools and talked with more teachers and students. The insides of the school buildings were beautifully constructed and decorated, mixing the functionality of a standard North American high school with Blackfoot structures and designs. 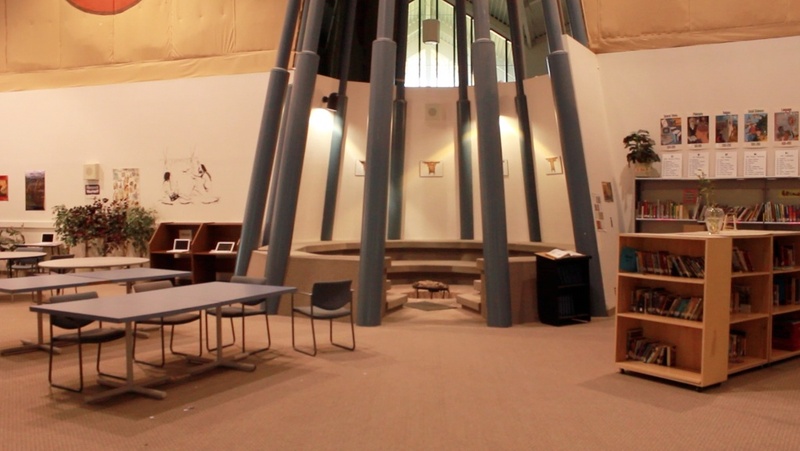 Central in the building is the library which has a large steel teepee emerging from its center forming and ceremonial space for lectures, events and reading. Alvine introduced us to Olivia Tailfeathers, the music teacher for all three schools. She writes her own music as well. She gave us one of her CDs and we are hoping to use a couple of the tracks as music for the film we will be editing on Red Crow Community College. Alvine is fluent in the Blackfoot language and is committed to the teaching that she is able to do, in spite of how busy she is. When we left the Kainai Middle School that day, we drove Alvine to Lethbridge to meet with Narcisse and Ryan Heavy Head. 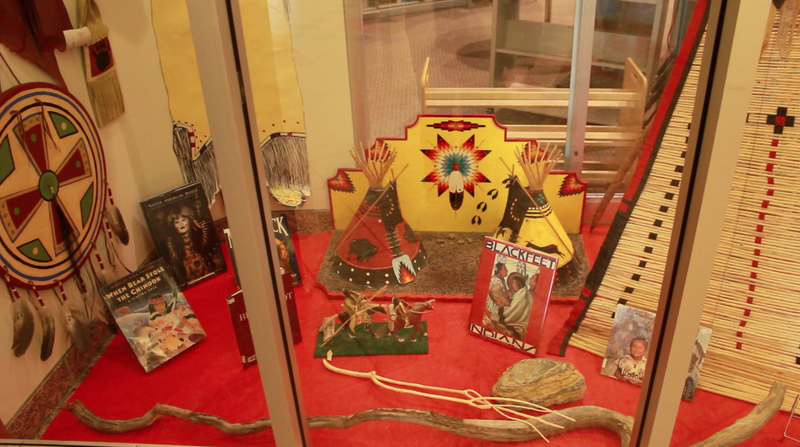 Along the way, Alvine told us more about her own learning of Blackfoot and the ways in which she has been teaching the language to children and adults. She herself had learned from her grandmother who did not speak any English. Alvine’s grandmother had taken her outside on long walks, teaching her words with the land. The Blackfoot language emerged through the land, and this was how Alvine was taught the Blackfoot language. She discovered that it was also the best way for her to teach the language. In the school where Alvine taught we were especially excited about the project she told us about which brought the knowledge of local plants and their uses into the school. 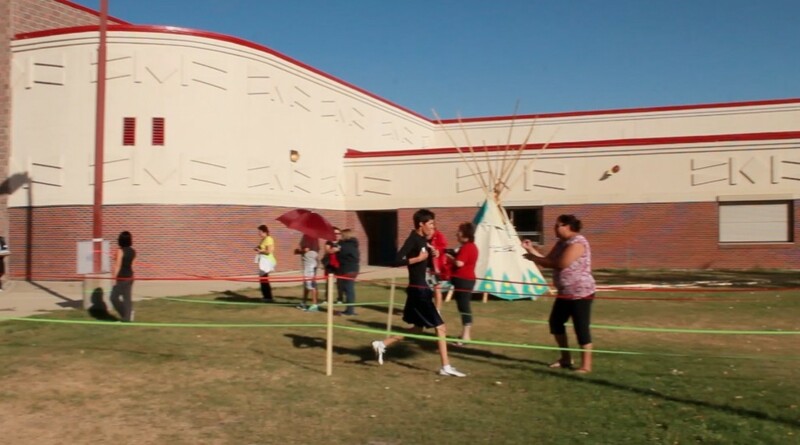 In this language teaching/learning approach, students had to discover the plants growing around the school area, find out their Blackfoot names and their traditional use. 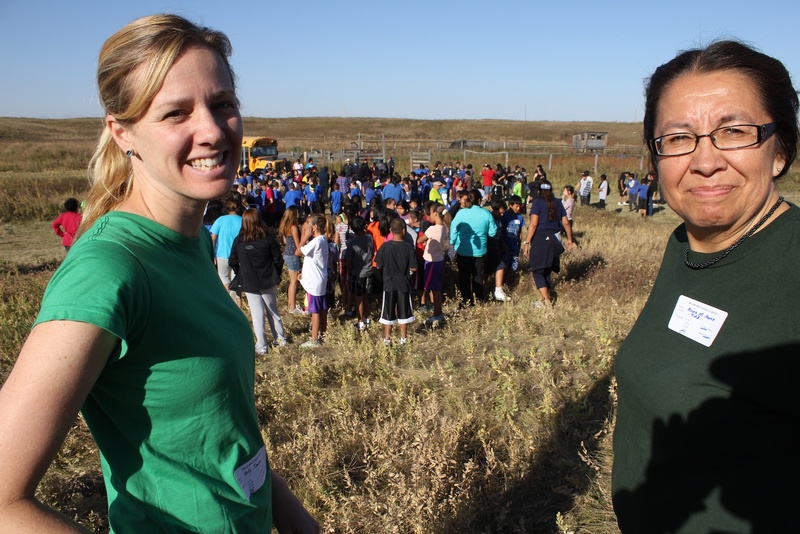 Alongside Blackfoot language teaching, Alvine coaches running. Being outside, on and with the land is a deep significance that crosses both of these very different reasons for and approaches to, learning.